In agile software development, the team is the smallest unit we care about (sorry to those 'individual contributors' reading). Although they're the smallest unit we care about, teams are the most important. The Agile Manifesto itself stresses that the success of agile methodologies is through the team's ability to be self-organising, cross-functional and flexible. So how do we both foster success at the team level, and ensure that success flows up through the organisation? We're with you Todd! 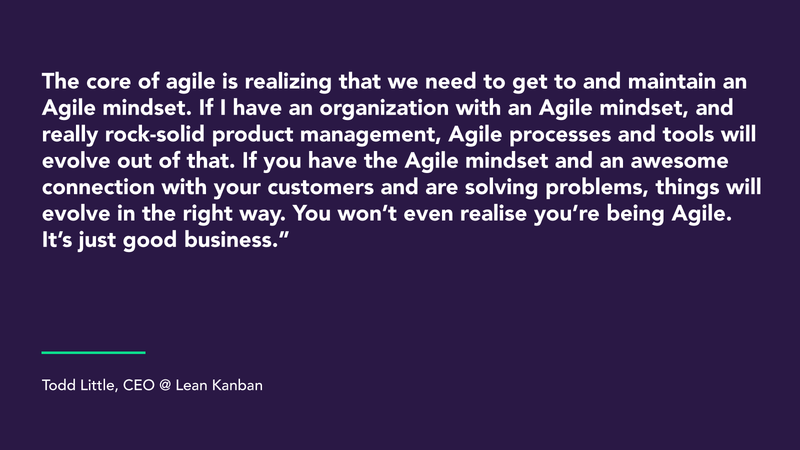 We often hear organisation say, "We're 'doing' agile", and this is perhaps the most difficult part of an agile transformation - trying to change the mindset of organisations, and their leaders, that agile is not something you do, it's something you are! So we know that we must first change an organisation's mindset to one of agility, but what's next? One of the foundational aspects of organisational agility is ensuring that teams are heading in the right direction and aligned around a strategy. If teams aren't working on the right thing, then they are not being effective. No point pushing out more 'stuff' if it isn't adding value to customers and the organisation. So, scaling agility requires teams to be aligned around those key outcomes the organisation aims to pursue. And good tools, that talk to each other, help teams to do exactly that. Sometimes we want to pull back on the flexibility to successfully scale agile. I'll give you a quick example of what I mean by this. We have 30 teams in product and engineering and they have each selected their own method of recording their objectives and what they hope to achieve on a day to day / week to week basis. In an organisation this size - say, 300 people in product and engineering - having visibility across what these teams are working on and what they plan to deliver, and when, is important. This is where consistency in tools and method can play an important role in scaling agile in a organisation. Ensuring that a teams success flows up through the organisation regardless of size. It isn't that agile at scale needs structure per se, yet that structure can assist, promote and encourage agility. But before we can implement these tools, we must first ask, "what are the key things team's at every level of my organisation need a tool to do?" And like many team's who have asked this question before, you'll soon discover that you will be hard pressed to find a single solution that fits the needs of every level of your organisation - and so the idea of implementing a single solution is not only not advisable, it is actually not viable. So what can we do to ensure that we scale agile from the team level, through to program managers and executives? Program managers and executives seek a tool/s that "rolls up what 100+ teams are doing across the organisation into a single view". Program managers and executives need an overall picture of the progress the organisation is making towards its desired outcomes, whatever the planning cadence. But if we go back to our teams, you know those small crews that set the foundation for the success of agile adoption? 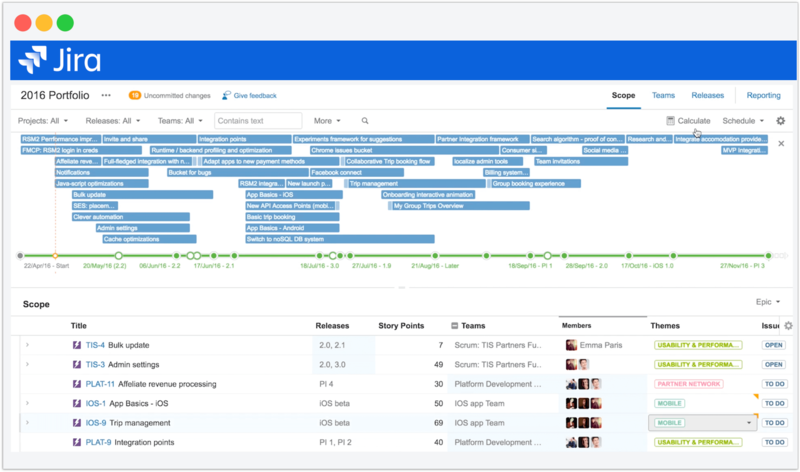 Is a rolled up view of what 100+ teams are currently working on going to help that team with their day-to-day? Nope. And that's simply because the product manager and team don't want, or need, the same things from a tool as a program manager or an executive. A single source of truth, and context around their everyday work is what's most important to a product manager and the team. They need a simple, clear, visual and easily accessible plan of action for where they're headed and how those pieces of work, connect with the big picture stuff, and they need to be able to communicate that with their stakeholders. They don't need their work getting lost in the portfolio crowd. As we mentioned earlier, you'll be hard pressed to find a single solution that will give your team's at both levels what they want. And so we're here to offer you a dual-solution for the example given above. Shared product vision & direction: Easy Agile Roadmaps allows teams to visualise shared product vision at a glance, through the sequence of features for delivery to customers. Contextualising team's everyday work: keep stakeholders appraised of updates by allowing teams to track their progress towards epic completion. Agile team collaboration: allows distributed teams to make better informed decisions by identifying group purpose and structure, and keeping stakeholders informed in real-time. 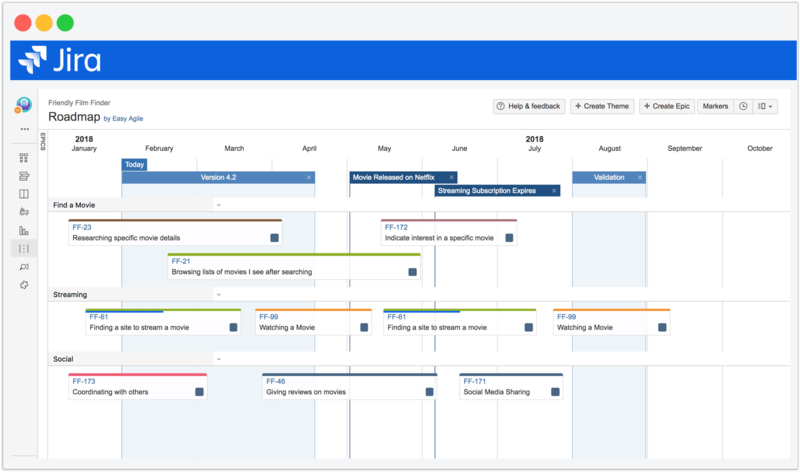 Version & static markers: highlight important dates with static markers, as well as show versions, from start to release date and visualise the goals the team are striving towards. 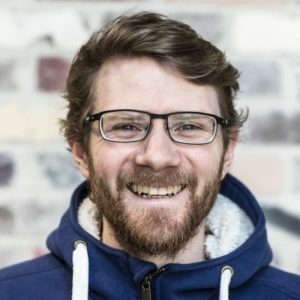 Nick Muldoon joined Atlassian in 2007 and in 2009 became product manager for what was then a new acquisition, GreenHopper. 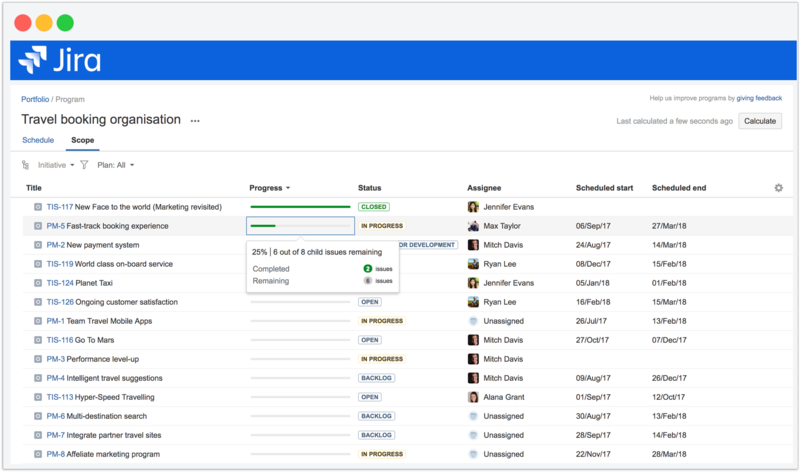 It has since grown into Jira Agile and is now Jira Software. Moving on from Atlassian in 2012, he became an agile evangelist, guiding customers through their agile transformations. In 2013, he joined Twitter and worked with the leadership team as they began their agile transformation. During this period, he joined the Agile Industry Consortium where people from large companies all over America come together quarterly and share their agile transformation experiences. Nick returned to Australia with his young family in 2015, where he joined Dave Elkan, another Atlassian Alumni, in founding Easy Agile, which focuses on delivering story-mapping and roadmapping solutions for Jira.